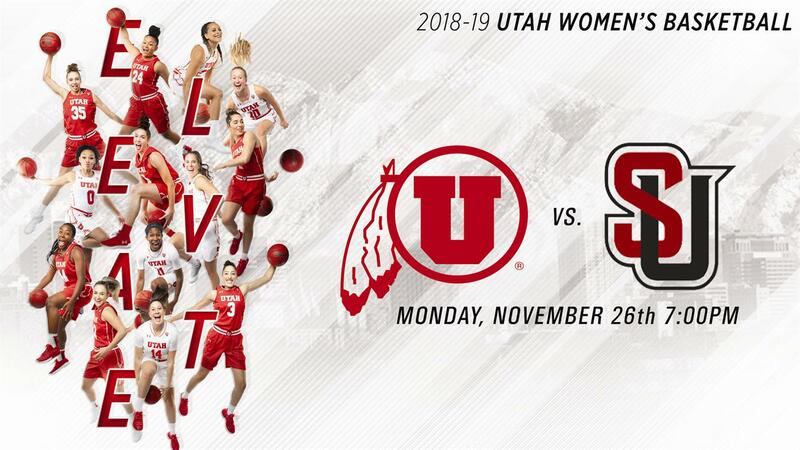 Monday, Nov. 26, 2018 | 3:30 p.m.
Is your future college student interested in attending the University of Utah? Are you or is someone in your family interested in pursuing a degree at the U? Do you have questions about the admissions process and employee tuition benefits? If so, please join us on Monday, Nov. 26 at 3:30 p.m. in the Emma Eccles Jones Welcome Center for a special presentation for U parents, faculty and staff. Our admissions staff will be on hand to answer your questions about employee tuition benefits, financial aid, the admissions process and more. 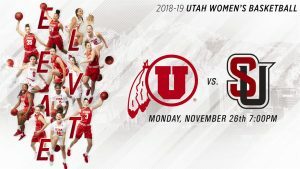 Monday, Nov. 26, 2018 | 7-8:30 p.m.
Utah Women’s Basketball team hosts Seattle at 7 p.m.
Free for students with their UCard. 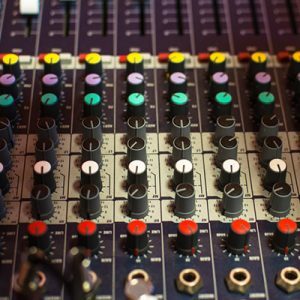 Monday, Nov. 26, 2018 | 7:30 p.m.
Music for electronics and live instruments are the focus of this electroacoustic concert. 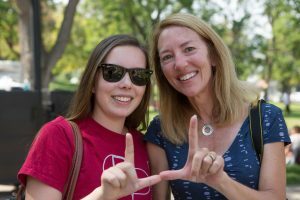 All the music will either be performed or composed by University of Utah students. Tuesday, Nov. 27, 2018 | 7:30 p.m. 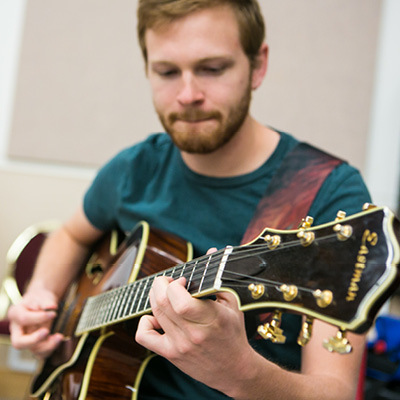 Directed by Geoffrey Miller, the School of Music presents an exciting performance by the Jazz Guitar Ensemble. This guitar combo, paired with bass and drums, plays both original compositions as well as jazz classics. 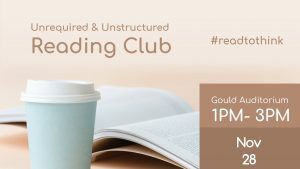 Wednesday, Nov. 28, 2018 | 11 a.m.-2 p.m. The University Campus Store will be hosting a Student Appreciation Day party between the hours of 11 a.m. to 2 p.m. on Wednesday, Nov. 28 for all University of Utah students. There will be free pizza, free souvenir polaroids for the first 1,000 students and giveaways, including a Nintendo Switch. 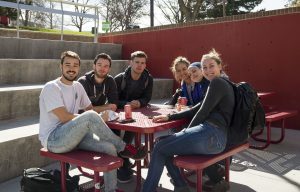 * The Campus Store also offers a 30 percent discount all day for University of Utah students that present a valid UCard. This bi-annual event is the Campus Store’s way to give back to our amazing student body and we welcome all students to attend. 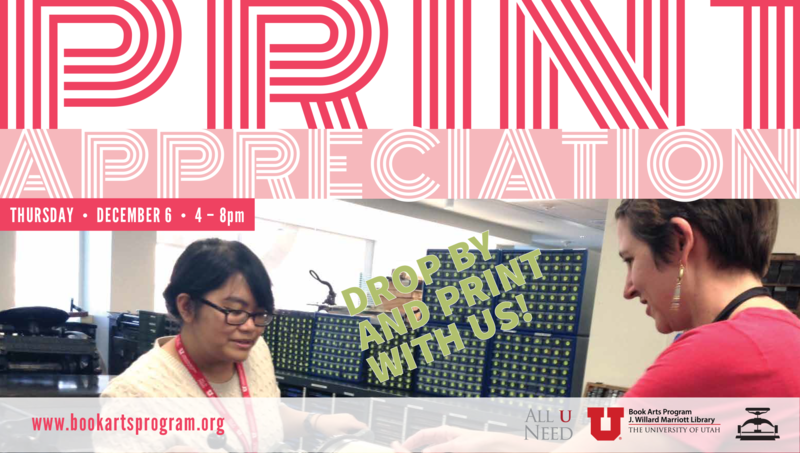 The University of Utah is lucky to have such a unified student body and it’s a pleasure to extend our gratitude and support to you. Food and prizes will be available between 10:30 a.m. and 1:30 p.m. or while supplies last. *Some restrictions apply. Valid for in-store purchases only. Excludes computers, electronics, textbooks, graduation regalia, diploma frames and services. Cannot be combined with other discounts or coupons. Wednesday, Nov. 28, 2018 | 1-3 p.m.
Drop by for free coffee, hot chocolate and tea as well as a wide selection of books including favorites of U students, librarians, staff and the Campus Store. Wednesday, Nov. 28, 2018 | 5:30 p.m.
Economics of Inequality is a panel for discussing the ways Capitalism can impact people of color, the environment, women’s rights, reproductive justice etc. 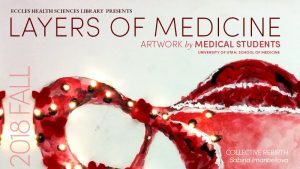 Wednesday, Nov. 28, 2018 | 6-9 p.m.
Queer activism, resistance and breaking stigmas through art. 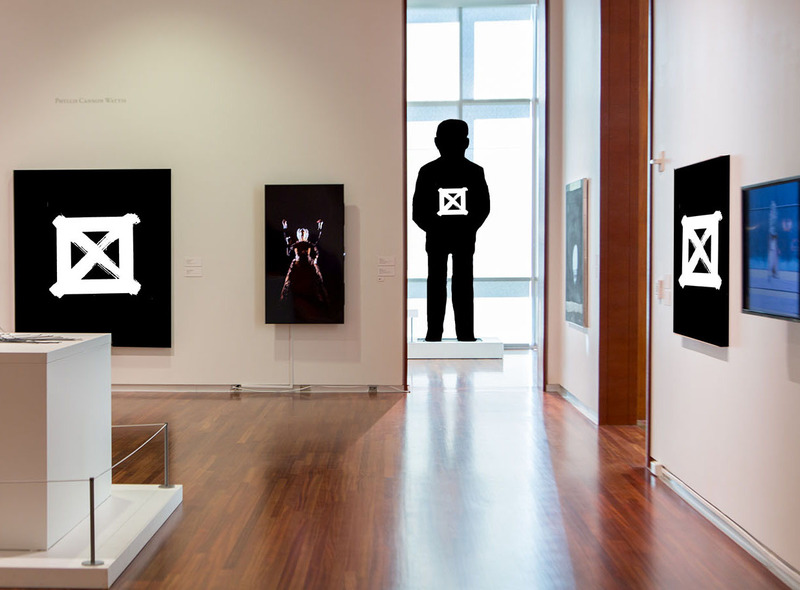 Gather at the UMFA to discuss, reflect on and learn about the AIDS epidemic and how it continues to affect the world today. Join youth and community leaders in discussion and then make posters that draw inspiration from artists impacted by the AIDS epidemic. Refreshments will be served during the poster workshop. Click here for details. 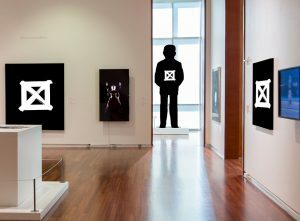 Viola Frey’s “Ethnic Man” (1991), a signature object in the UMFA’s modern and contemporary gallery, will be covered from view to call attention to the lives and achievements of those lost to AIDS. Presented in partnership with the University of Utah LGBT Resource Center, SQuARE: Students for Queer Art, Resistance and Education, Planned Parenthood’s Teen Council and Visual AIDS. Thursday, Nov. 29, 2018 | 12:15-1:15 p.m. 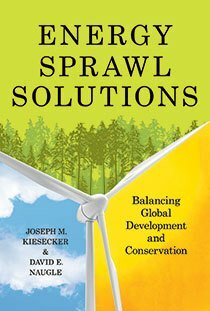 In Energy Sprawl Solutions, scientists Joseph M. Kiesecker and David Naugle provide a roadmap for preserving biodiversity despite the threats of energy sprawl. Their strategy—development by design—brings together companies, communities, and governments to craft blueprints for sustainable land development. This commonsense approach identifies and preemptively sets aside land where biodiversity can thrive while consolidating development in areas with lower biodiversity value. This approach makes sense for energy industries and governments, which can confidently build sustainability into their energy futures. This contributed volume brings together experts in diverse fields such as biodiversity conservation, ecology, ecosystem services, wildlife, fisheries, planning, energy, economics, and finance. Early chapters set the context for global patterns of biodiversity risk from energy extraction and the challenges of achieving a green future while maintaining energy security. Middle chapters are devoted to case studies from countries around the world, each describing a different energy sector and the collaborative process involved in planning complex energy projects in a way that maximizes biodiversity protection. Detailed maps and charts help orient readers to countries and energy sectors, providing proof for what is possible. With biodiversity declining rapidly because of an energy-hungry world, this book provides a needed guide for elected officials, industry representatives, NGOs and community groups who have a stake in sustainable energy-development planning. The 2018-19 Utah Law Review presents “The Opioid Crisis: Paths Forward to Mitigate Regulatory Failure.” The symposium will critically examine failures of the pharmaceutical market, subsequent inadequate regulatory responses, and possible solutions as the nation moves forward in addressing the crisis. 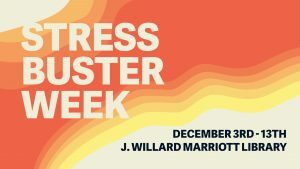 Scholars from around the country will discuss the impact of regulation from the national and state level, the impact of addiction on communities, and how public health research should inform future policy and regulation decisions. Read more here. Five hours of CLE (pending). Lunch provided. Free and open to the public but registration is requested. Register online here. 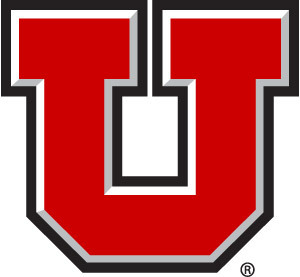 Free parking is available at the Rice-Eccles Stadium. We encourage you to use public transportation for our events. Take TRAX University line to the Stadium stop and walk a half block north. Friday, Nov. 30, 2018 | 12-1 p.m.
Dr. Amy Locke MD, FAAFP, associate professor of Family and Preventive Medicine and co-director, Resiliency Center will be discussing when life gets hectic, the first thing many of us sacrifice is self-care. Self-care is crucial to be high functioning and effective at home and in the workplace. Unfortunately, when we’re busy or stressed, it’s common for that to be the first thing to go. 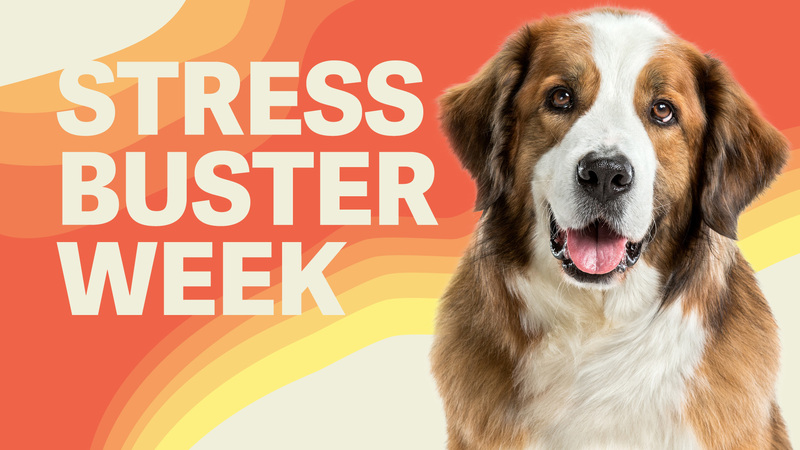 How does one manage a busy life and stay positive, happy, and resilient? 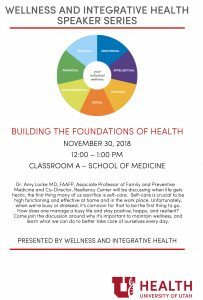 Come join the discussion around why it’s important to maintain wellness and learn what we can do to better take care or ourselvesevery dayy. 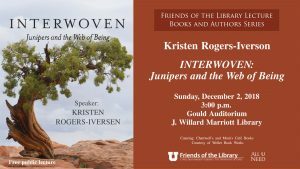 Sunday, Dec. 2, 2018 | 3 p.m.
Join us for an enlivening afternoon with author Kristen Rogers-Iverson. 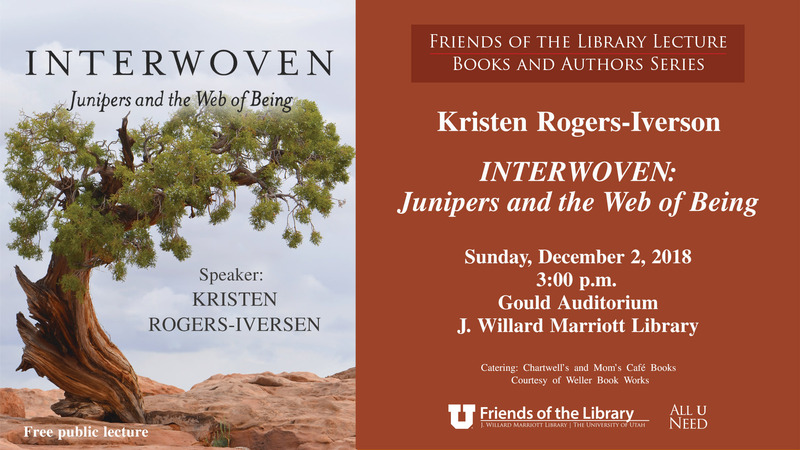 Kristen will speak about her research in writing her book “Interwoven: Junipers and the Web of Being.” The lecture is free and open to the public and refreshments will be served. Friends of the Library Lecture with author Kristen Rogers-Iverson. On Thursday, Dec. 6, the University Campus Store and University Credit Union will host its annual Faculty and Staff Appreciation Night, showing gratitude and support for the university community by offering 30 percent off purchases all day, from 7:30 a.m. to 7 p.m1. Join your friends and family at the Campus Store for Starbucks refreshments, amazing prizes, including an Apple Watch and more. We will have Santa there to take pictures with your friends and family, in a professional photo booth. Plus, get your holiday shopping done early with new Utah outerwear and apparel, toys, games, gift items and more at a great discount. You can also enjoy the added benefit of getting your purchases gift wrapped for free. We hope to see you there. 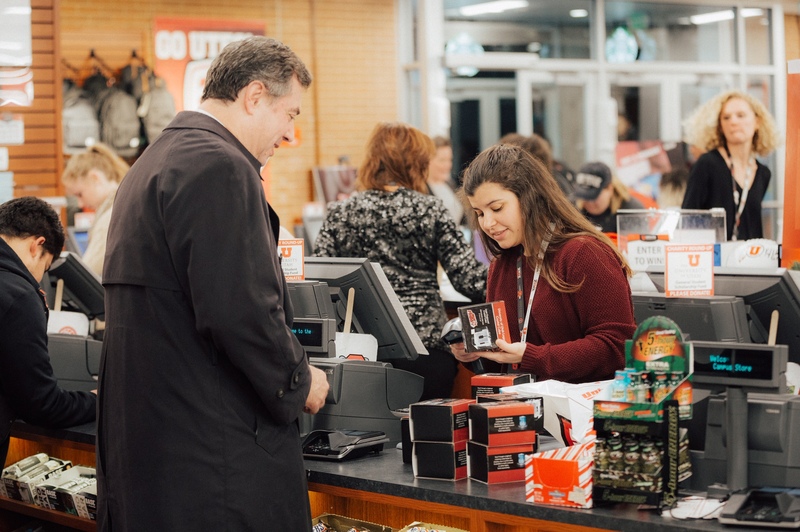 1Discount offered at all Campus Store locations, during regular store hours on Dec. 6, 2018, for faculty and staff who present a valid UCard. Discount excludes electronics, textbooks, services and cannot be combined with other discounts. No purchase necessary to be eligible to win prizes. Stay active during the winter interim with PEAK. 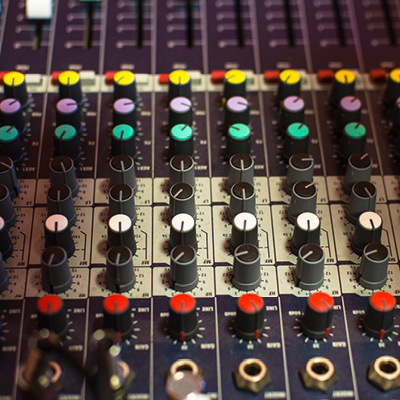 This shortened session is a great way to try something new! Registration is available here.